Gabriel Dumutru, 24, of Jevington Gardens, Eastbourne, pleaded guilty to driving a Toyota Corolla on Seaside Road, Eastbourne, on April 6 while more than twice over the drink drive limit. He gave a breath alcohol reading of 87 microgrammes. The legal limit is 35 microgrammes. He was fined £325 and banned from driving for 22 months. Ade Fermin, 26, of Bembridge Road, Eastbourne, pleaded guilty to assaulting a woman by beating her. The offence took place on March 25 at Stone Cross, Pevensey. He also pleaded guilty to two charges of resisting a police officer on the same date. The court made a community order with a requirement of 70 hours of unpaid work. Magistrates also issued a restraining order. 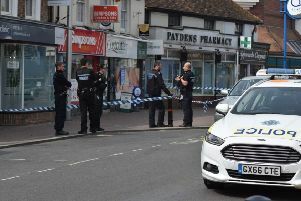 Alan Tusinski, 23, of The Broadway, Eastbourne, pleaded guilty to driving a vehicle on Seven Sisters Road, Eastbourne on April 9, while disqualified from driving and to driving with no insurance. He also pleaded guilty to driving while over the drink live limit, on Seven Sisters Road, on the same date. He gave a breath alcohol reading of 54 microgrammes. The legal limit is 35 microgrammes. He was sentenced to eight weeks in prison, suspended for one year. The court also made a community order with a requirement of 200 hours of unpaid work and banned from driving for a further 18 months. Magistrates said the reason for the sentence was to deter him and others. James Elliott, 24, of Norway Road, Eastbourne, pleaded guilty to damaging the bonnet and windscreen of a Vauxhall Corsa car. The offence took place at Eastbourne on June 23 last year. He also pleaded guilty to causing damage to the bonnet of an Audi car at Eastbourne on June 24 last year. He remanded on unconditional bail until May 25 to allow for pre-sentence reports to be prepared.